News out of England this week suggests the Rugby Football Union may activate its "exceptional circumstances" clause with regards to foreign eligibility, affording Toulon star Steffon Armitage the chance to play at Rugby World Cup 2015. It may not yet be a done deal but the conversation has dragged on for some time and now it seems as though the path will be cleared for the five-Test back-rower, whose England hiatus could come to an end when Stuart Lancaster names his initial 40-man World Cup squad. Australia and New Zealand - the other two nations who will not consider overseas-based players for Test selection - on the other hand, show no sign of abandoning their foreign protocols ahead of this year's global showpiece. New Zealand, with their glorious playing depth, do not need to make such a change. Aside from the injury-prone Richard Kahui, who is plying his trade in Japan, the country's top talent is spread across the five Super Rugby franchises; All Blacks coach Steve Hansen is sure to have a few headaches come selection time, but he won't be cursing the Euro or Yen. Australia, however, look to be a different story. 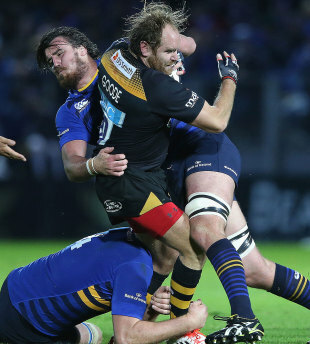 While the common belief is the Australian Rugby Union's laws on foreign eligibility serve the best interests of the local game, a steady stream of talent heading off-shore has some, such as Greg Growden, questioning whether those same protocols need to be relaxed. The ARU has already altered its stance on sabbaticals, permitting a select number of players a "flexible contract" if they commit themselves to Australian rugby long-term. But should they go a step further and enact an "exceptional circumstances" clause, such as that upon which Armitage is relying? The term "exceptional circumstances" is non-descript and wonderfully ambiguous, and there are two separate cases that suggest the ARU should write such a clause for the betterment of Australia's World Cup hopes. The Wallabies' backline stocks received an added boost on Tuesday when James O'Connor fronted the media in Brisbane, spruiking the "changed man" line after 18 months away with London Irish and Toulon. But the backline has never been a problem; anyone who watched the Wallabies' last outing for 2014, at Twickenham, can attest to that. Those same people will tell you the problem is in the Wallabies' tight-five. Just an hour or so from where the Wallabies were beaten up - legally or illegally - at scrum time, Salesi Ma'afu has built a reputation as one of the Aviva Premiership's finest props and a key contributor to the Saints' maiden title in 2014. "There have been low points for Ma'afu - his red card in the semi-final for the punch on Tom Youngs was disgraceful - but his peaks far outweigh the troughs," ESPN Associate Editor Tom Hamilton said. "In his two seasons at the Saints, he has established himself as one of the premier tight-heads in the premiership and an essential cog in their premiership-winning team. That Toulon see him as the ideal replacement for Carl Hayman is testament to his ever-rising stock." Ma'afu left Australia with 14 Tests to his name, but he was seemingly well down the prop pecking order. Two years on, his reputation has sky-rocketed and his experience in English conditions would surely help an under-fire Wallabies scrum. Kane Douglas, meantime, is just five months into a stint with Irish club Leinster after departing Australian rugby at the peak of his powers following New South Wales Waratahs' Super Rugby triumph. He has made a slow start, but the consensus suggests the 14-Test lock is starting to find his feet. "I think it takes time when you come to a new team," Douglas told thescore.ie "You've got to adjust to different calls and the different people you're playing around. I do feel a bit more comfortable the last few weeks and hopefully I can just get better. "You spend a bit more time in the scrums and lineouts, that stuff. I was sort of chatting to Matt after games and saying 'I'm feeling pretty stuffed. I was probably just as fit as I was [at the Tahs], but you probably need to be even fitter, especially forwards, because you're using a fair bit of energy up at the set-pieces." Another few months in the Irish set-piece education system will only improve Douglas, but the former Waratahs lock, like Ma'afu, will be forced to watch from the stands when the Wallabies head north in September. Both men are at ease in the knowledge they won't don the green and gold in England, and Douglas, at the age of 25, could foreseeably get another World Cup chance in Japan in four years' time. But ARU bosses back in Sydney should seriously ponder "exceptional circumstances" clause of their own. It could be instigated purely for forwards, a nod to the north as a kind of set-piece "finishing school", thus ensuring Australia's best backs remain in Super Rugby and feed the country's thirst for football "entertainment". Unfair on the likes of Israel Folau, Quade Cooper, et al? Perhaps. But the overseas offers will likely be there towards the end of their careers, and that's not always the case with the big men up front. And Folau, Cooper won't much care if they win the World Cup as a result of enactment of a clause. It will be interesting to see the final outcome on Armitage, whose form over the past few years demands an RFU backflip; Douglas and Ma'afu cannot lay claim to being the European Player of the Year, but Australia's patchy tight-five stocks should have the ARU considering some exceptional thinking of their own.